I am exhilarated. The past two days in my calculus classes have taught me more about teaching (and more about student learning) than any other days this year. I am so engrossed in what’s going on that I feel like I might be at the brink of something big for my teaching… Maybe not, maybe this is just a passing thought, and I might grow bored of this, but right now it feels big. It could be a genesis for me-as-teacher. As you know, I’m interested in the questions of how to teach problem solving, how to hone intuition, and how to build independence and tolerance for frustration for students. But on a whim, last week, I decided to temporarily throw all those huge questions out the window and just do something, anything, to get students to problem solve. My kids had just had a test on basic derivatives, so it was the perfect time to digress before Thanksgiving break. So you know where we are… my calculus students had learned how to find derivatives of basic functions, they had learned the product and quotient rules, and they had a bunch of the conceptual ideas down. (For example, they could explain why the power rule works and where the formal definition of the derivative comes from.) But that was it. We focused on finding the derivatives of function after function after function. So I gave myself 3 days to do something. I crafted a worksheet with 7 questions. Many just taken wholesale from our textbook, or slightly modified/scaffolded. I didn’t try to find hard problems. I have no interest in throwing my kids into the deep end of the pool . Instead of “hard,” I tried to find problems that were different than any problems they had seen before. You might look at this sheet and say “yeah, any calculus student who knows how to do derivatives ought to be able to do these questions.” But the first thing I learned in these two days is that that would be a huge mistake. In fact, it was a mistake I made for the past two years. I would assign one of these sorts of problems for homework, and the next day students would come in asking questions, and we would go over how to solve it in class. And by “we” I mean “I” would explain the solution asking students questions along the way. Then my kids would ostensibly know how to solve the problems. And I would move on, knowing they had “learned more calculus” and mastered “one more type of problem they might confront.” And although it may be true, my kids never really had to flex any of their intellectual muscles. They learned another algorithm. They didn’t ever have to struggle, minus a few minutes (seconds?) at home before giving up. Here’s how these days went. I put them in pairs. I tell some of the groups to work on problems 1, 3, 5, and 7, and the other groups to work on 2, 4, 6, and 7 — starting with whichever question strikes their fancy. I tell them that I won’t be of much use to them. That they are going to have to use their wit and wiles to do these problems. That they should ask their partners their questions, that if they really get stuck they should go to another group, and if they really, really get stuck, they can talk to me. Although I won’t be of much use to them. They start working. For the remaining 40 minutes. They are totally on task. They are struggling to understand the questions, and they are trying to explain their ideas to each other. For example, for question 1, some groups just couldn’t understand what the question was asking. I have to encourage a couple of people to work as a team instead of independently, but other than that, my students are killing it. It is amazing. I can’t understand what it is, but my kids are really into this! One of the groups which is working on problem 4 says “Mr. Shah, now that we’ve done part (a) and part (b) for this question, we’re not problem solving anymore. We’re just solving problems when we’re doing part (c).” I almost cry. My kids are starting to recognize on their own that once they problem solve and get a technique down, they are then only solving problems. They have another tool in their toolbelt with which to problem solve. At the end of the class, I say “Stop.” Most have only solved 2 or 2.5 questions. I smile and tell them that’s alright, and that they are doing so amazingly that I am not going to assign any homework. The “easy” questions I chose aren’t so easy, since my kids have never seen questions of that particular form before. As I suspected, this is problem solving for them. The kids who are afflicted by “learned helplessness” (read: who always raise their hand at the first sign of trouble) can think for themselves. In other words, my kids can be independent thinkers if forced to. Kids need time to struggle and grapple and do basic things like draw parabolas and hyperbolas. I assume they can do these things quickly. They can’t. My kids are not to be underestimated. I realized that I regularly underestimate the ability of my kids to think for themselves. Which is one of the biggest reasons it has been hard for me to let go of my teacher-centered class, and lead more of a student-directed class. Many of my kids actually found math fun/interesting! Without the stress of grades and time pressure, they got to enjoy the puzzle aspect of math! I sent out a survey to my students asking them about this first day of problem solving. It’s exciting to think that we are finally able to combine a lot of the formulas and other material we learned previously to solve a single problem. I think it went well. It was tough, but rewarding to get an answer, even though we still weren’t sure if it was correct. I found the class really interesting because I often find myself neglecting my brain and just accepting what teachers tell me. It’s a nice change of pace to think for myself for once and truly try to understand it.What makes me excited about doing more of this is that I feel the more we do, the more comfortable we will be with doing them. I think it went really well, actually. I liked the problem solving. I liked doing problem solving because it was different from what we’re usually doing. It’s also a good way to work on a different way of thinking about things, which I’m always appreciative of. I think it went well. It’s hard to start out a problem, but then at a certain point things start to click. It wasn’t bad, it was good working in groups so that we can bounce ideas off of each other. It was good applying the things we learned previously. Im excited to be able to do harder problems, and it makes the easier problems look and feel alot easier. It’s really interesting and challenging. Solving these problems is like solving puzzles because you already have the pieces, but you need to find a way to piece them together so they form a whole. I like working with a partner on problems. 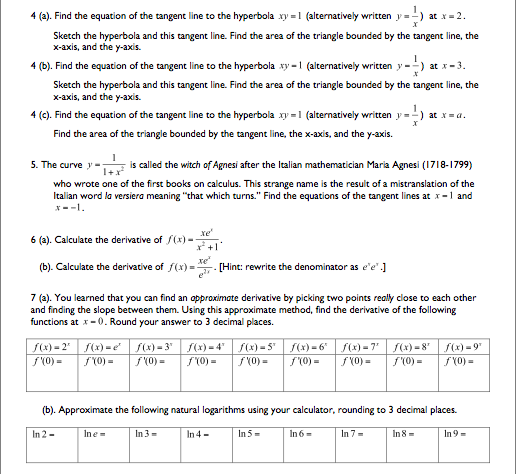 i think that these problems feel very comprehensive which is fun. There were no negative responses. There were anxieties though. All of their anxieties about problem solving boiled down to two things: grades and their ability to actually do the problems since there is no set method to solving them. I start out the class reminding the kids about problem solving. I talk about their survey responses, and the anxiety about grades. I tell them to mitigate their fears, whenever we problem solve I will always give them a choice of problems to work on, I will let them work in pairs (at least for now) so they can bounce around ideas, and that I will grade them on more than just answers. I will grade them on their formal writeups and the clarity with which they explain their approaches to the problems, even if none of their approaches succeeded. My kids seemed to feel those addressed their concerns. I set them off to work with their same partners. If they worked on the even problems, they should work on the odd problems (regardless of whether they solved all their even problems). If they worked on the odd problems, they should work on the even problems (regardless of whether they solved all their odd problems). The students work. I wasn’t sure if they’d still be into it, but they are. Five minutes before class ends, I stop everyone. Most groups had gotten 3 more problems done. I tell everyone their homework. 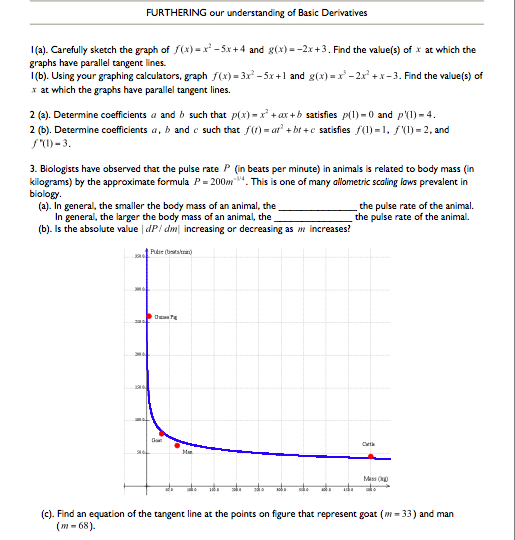 Each student must pick two problems and do a formal writeup for those two problems. No one in the group can do a formal writeup of the same problems, though. I ask them how day two went. They agreed that it was (on the whole) much easier the second day, now that they knew what they were doing and how to work with their partners. I suspect that two days of problem solving is enough. I think more time will make what we’re doing into a chore instead of something new and exciting. My kids really, really want to know if their answers are right. I refuse to tell them. That bothers them. I tell them that’s part of problem solving. And then I asked them if they have a way to check their answers themselves? 1. Tomorrow, I’m going to have each student exchange their writeups with their partners. They are going to read through the writeups, and come up with comments and suggestions for clarity. Diagram here? Explanation there? After 15 minutes of discussion, I’m going to tell them that the remainder of their classtime will be spent writing up a better version of their partner’s solutions. Their final draft. Which will be graded. 2. Now that my kids have struggled with some easier problems, and know they are capable of working them, I created a bunch of harder problems. I am going to distribute these problems to my classes, partner them up, and give them one week and two weekends to solve 2 of the problems. I will give them 20 minutes to work together in class in the middle of the week. The problems are here, if you want to see them. 3. I’m going to photocopy each classes’ writeups and distribute them. We’ll talk about what makes a good writeup and what makes a bad writeup. 4. I think I might spend two days after each unit doing this. One thing I want to avoid at all costs is being one of those teachers who says “I teach problem solving” while actually just giving hard problems to kids and then watching them struggle. I want to teach problem solving. That’s tough. I tried this exact same thing this year (except without the introduction–just tossing them in to optimization and related rates without must help). They REALLY struggled through the first two or so and then understood it better by the end. They were also helping each other. My only issue was, “What do I do?” I mean, I felt like a bum just wandering around making sure they were on task, but not really doing anything else. This is wonderful. I love when I make time to do this with kids. Those are days when I tell the kids that I am the substitute that just never understood math. I have the same feeling as David P (feeling like a bum) plus this guilty feeling that I’m not going to “cover” all of the material. Our society doesn’t value slowing down and is obsessed with judging and placing blame. It’s a constant struggle. I haven’t thought of introducing the ideas from your white board image, but plan on it now. And I’m “just” an Algebra I teacher :). I also like turning this into a two-day experiment with feedback at the beginning of day 2. Great job Sam. You are doing your students a huge favor by taking this approach. The refusal to give affimation when asked for it (“Am I on the right track?”) is tremendously important. You are turning those students into independent thinkers and are giving them a lot more help than if you were “helping” them, if you know what I mean. This sounds really exciting. I’m going to save it to read again next time I’m teaching calculus. I know about feeling useless when the students are working independently. I think for me that partly comes from an addiction to the high of conducting – leading a good discussion, or lecturing with them doing small exercises. Working well with the whole group makes me high. But this problem-solving is vital. Many teachers of young children talk about the importance of good observation (which includes writing it down) of what the kids are doing, and saying. When I get the kids working, I try to start writing down what I’m seeing and hearing. That gives me more than enough to do. And when I get back to the classroom, it’ll make for good blog posts about this sort of day. If I were doing this, I’d go over Polya’s 4 step process with them. 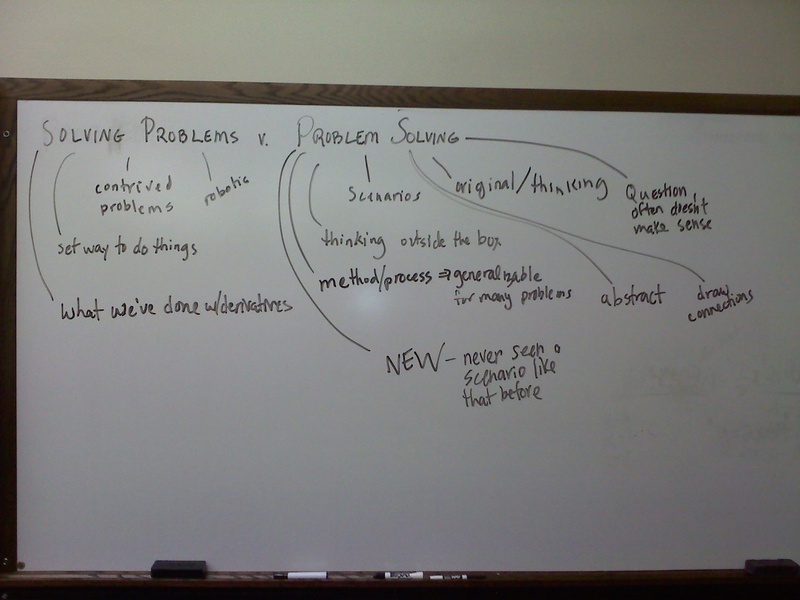 When I had Math for Elementary Teachers students do writeups of their problem solving process, they used that as a framework for the writeup. I like the last problem. They have to refine their partner’s writeup for a grade? What if the partner did nothing. or a really bad first attempt? I’m teaching a non-AP Calc course this year (for the first time at this school), and we’re going MUCH more slowly than you are, Sam, so I’m actually going to be able to do this (or something like it) come January. Very much looking forward to it–and thanks for the inspiration. It’s funny what time can do… a mere five years ago phrases like “student-centered” and “group work” would have set off an eye-roll and a sarcastic, dismissive comment from me. I think it was because whenever I had seen those things implemented (which was not that often at all) it was to the detriment of actually learning “real” math. “Making math FUN” was the mantra, and it was really just “fun” with some math sprinkled throughout. I was convinced that in order for my students to really learn all that I wanted them to, I had to be in charge and in control all the time. My involvement with PROMYS, which started the summer of 2007, started to change that. This was followed by my introduction to the math-teacher-blog-world over the past year or so. All of these people were like me, in that they genuinely loved math, and cared about the students both learning and enjoying math. So I’ve been paying a little more attention. I imagine that five years from now my classroom will be run rather differently from how it’s run now. Regarding that awkward (for the teacher) feeling of “not doing anything,” I believe it was educational reformer Ted Sizer (who died just last month) who once said that if aliens were to visit a typical high school classroom, they would observe that the teachers work very hard, and their students watch them work very hard. Which is not to say that teachers shouldn’t work hard, it’s just that they shouldn’t be the ones (always) doing the “math” work; the students need to be the ones doing that. I’m looking forward to trying this “solving problems vs. problem solving” approach. Sounds like a fantastic experience. I have been knocking ideas akin to this one around in my head for a while but have yet to come up with a lesson plan, exactly. I frequently have periods in my class during which I refuse to “help” students by verifying answers, directing inquiry, etc, but I don’t know how to get at that last bit you mentioned in your post… _teaching_ problem solving. I’ve been wondering about papers, or the writeups you mention. What potential is there for a class centered around writing? I am also interested in computer programming – if there were a language kids could really learn to use in a couple of weeks (geogebra? ), could a class use programs as the standard form of assessment? Writing and programming are connected for me in that both require a student to understand a concept perfectly in order to convey it convincingly. In group work, how do you ensure that each group member is problem solving? I have been trying to get more comfortable with NOT knowing things, and admitting that my grades will be imperfect, but it would be so nice to have a mechanism to guarantee that each kid is thinking. This is very exciting! My students came to the class having fantastic groupwork skills, but since I move so fast and don’t always feel like I have time to play up “helping each other out” and “figuring stuff out on your own”, they have gotten a bit lost. I’m going to try this though…it’s such an excellent idea! Ok, new questions involving this method… I assigned my students some problems and had them present to the class in pairs. They kept trying to ask me (during their presentation even), “Is that right?” And they got really annoyed with me when I’d turn to the class and repeat, “Is that right?” For this format, I think I need to have a grading system that includes the presenters as well as the audience’s participation in the presentation. I’m still trying to work that part out. But, what do we do when neither the presenters nor the class catch a mistake? I feel like I need to speak up at some point and say something. Do I just say, “There’s something wrong here…who can find it?” Do I point out where it is and let them fix it? When I tried to point out that something was wrong, they’d get frustrated and erase everything and try to start all over. Sometimes, that’s what was needed, but sometimes it was just that they left off the units on their answer. I guess it all comes with problem solving, but sometimes it’s really disheartening to see. So, I guess my real question is: When you let them work through the problems on their own, what do you do when nobody catches a mistake? How inspiring! Congrats on a fantastic couple of problem solving days! i’ve done a lot of this. are the rest of the class. This is great! I’m trying to think of how I can do it with my Algebra 2 classes. Thanks for sharing! an idea for you. Did the questions even need to be related to the course topic? I have made it a habit to give puzzles. Some classes get more, some get less. But early on in each class, I do an intro. I define exercise vs problem (much like your solving a problem vs problem solving) and I set up Polya’s four steps as the norm. The puzzles themselves are the problems I put on my site (sometimes modified up or down. And I also post problems for teachers, those don’t go for kids). I am absolutely convinced that the skills gained carry back into their regular mathematics performance. This is something that I want to do…You are absolutely right about the students needing to struggle through the stuff that they “should know” (i.e. graphing parabolas, etc) on their way to applying it to something new. Something I’ve noticed in my calc class is that when I do the talking/explaining, I make a lot of assumptions about what should be “easy” for the students at this point. This type of experience forces *them* to do the thinking and analyzing of what’s “easy” and what isn’t. @David P…I’m going to try this with Max/Min problems per your suggestion…it’s going to be hard with only 1 student that can’t bounce ideas off anyone but me! How did the write-ups go? How much did you intro a formal writeup before this? I kept putting off grading them, but I finally am down to the final three. They are FANTASTIC. Like, amazing. Some write *too* much but almost no one hasn’t written enough. And for the most part they are clear. I kept on them to make sure they were explaining why they’re doing what they’re doing in the problems, and that they are writing for someone a little less capable than themselves. You’re writing this to help THEM. After I reminded them how much they struggled to understand and be able to solve the problems, I told them they needed to be extra explicit about the parts they struggled on, because their slightly-less-capable reader will definitely struggle there too. That’s exciting, Sam. Would you be comfortable sharing one or two here? I want to, but it’s student work so I don’t think I feel comfortable… but I might ask one or two of them if they cared if I shared their awesome work with other teachers… with their names blocked out of course. This is a fantastic example of what the power of mathematics really is: the ability to think, reason and apply what you know to novel situations as well as the ability to critically reflect upon the reasonableness of your work and final solution. I’m curious to know how you graded these? Did you have a series of criteria for each aspect of the student’s work? Knowledge, Choice (and justification) of Technique, Communication, Reflection? Also, I’m giving an MYP Mathematics workshop in March and I was wondering if I could use your post in my workshop when we discuss criterion-related assessment. Thanks for your consideration. Of course you can use the post for whatever you want. As for the grading question, I handed out a rubric with some critereon. I would copy them here but it’s on my other computer. If you want, just email me at samjshah atsymbol gmail dot com and I’ll get it to you. But I’m grading more holistically. What I did was I had kids in each group of two each choose 2 problems to do formal writeups so the group had a total of 4 writeups. I told them what they needed and what made a good/bad writeup (but I didn’t have time to write up examples this year) and told them to try their best writing them at home. They did their writeups at home, came in the next day, and I had them exchange them with their partners, and they had to read and critique. (Again, I’d liked to have an example to have critiqued together in class, but no time.) I emphasized that the reader show know what’s going on at each step, and since the reader was a little less capable than they were, that they needed to explain WHY various steps were being taken. Finally, they each had to rewrite one of their own (with their partner’s feedback in mind) and one of their partners and turn those in. I don’t know about the exchange and rewrite thing. My kids were miffed about having to do a formal writeup and then having to do it a second time with revisions. I might find a way to change that. The writing part was the part that seemed to be the biggest turn off. As for grading, since this is the first one, I am grading them holistically. I’m marking places which are great / confusing and making a few additional comments. The biggest thing I learned is: I can’t think about problem solving as picking tricky or elegant problems that I find fascinating. I mean, I can, but those problems are not usually within the grasp of my kids. I want them to feel like they accomplished something (which they did). I learned that by just watching them struggle with the basic problems I gave them, these were the right level of problems; problems in a slightly different form, problems that required just one additional thing that we hadn’t talked about in our class but they had learned previously (e.g. systems of equations or parallel / perpendicular lines). In the MYP, we’d call those ‘unfamiliar situations’ and I believe that is what true problem solving is all about: taking what you’ve learned, realizing that it may (or may not!) apply to a totally different problem and finding ways to make it work. From a meta-cognitive (I love that word!) point of view, I find one of the most important things to ask the students to articulate is why they chose the techniques that they did; what was it about the problem that made them decide to approach it in that way? It can generate some fabulous conversation when two students saw two different (but equally valid) ways of solving the same problem. It can also help highlight misconceptions. I think if you have exemplars (which you now do thanks to this batch of work) and a solid rubric for each criterion that you are interested in assessing (mathematical skills, problem solving technique, communication, evaluation of results) then there is no need for the re-writing bit. Guide the students in how the assessment criteria will be applied, allow them the chance to assess one or two examples and then let them at it! Finally, I think with enough practice your students will have the confidence and, more importantly, the mindset to approach any problem. But this does take considerable practice and buy-in from students, parents, colleagues and administrators since it may mean a reduction in the amount of content that you can cover (and an increase in the actual understanding of mathematical concepts). REVISIONS! That is what I need to have them do! Sometimes I get so frustrated along with them when theyre doing something like this. This is only my second year teaching Calc and because last year’s kids were very used to me and these group works, I didnt notice the resistance. This year, very different. Thanks for the examples also. I’m having a really hard time on which problems to choose to start getting their feet wet on these. and I LOVE the fact that you explicitly went over the difference between solving problems and problem solving. Brilliant! =) Thanks!